As we have all experienced, the quality of rags from supplier to supplier varies considerably, and once you have found a good supplier of quality WHITE T-SHIRT RAGS, you stick to them. 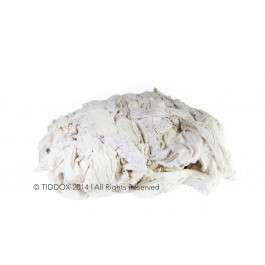 Well, TIDDOX is that supplier and we take great care in ensuring our rags are of the highest quality, soft, absorbent, washed, clean and metal detected, so our customers can rely on a consistent quality product. Particularly when the white rags are being used to polish and detail expensive vehicles, it is just not worth being tempted by cheap rags just to save a little money, only to end up having an undetected zip, button, or even worse a pin, hidden in the rags scratch the surface of the car being cleaned! Quality control and metal detection processes to ensure each bag of rags is free from any foreign objects are crucial in the import and distribution of recycled rags, and our reputation for a consistently clean, safe, quality product sees TIDDOX RHINO RAGS in demand in every state nationwide! Furthermore, RHINO RAGS are environmentally friendly, being recycled and washed from discarded T-Shirt material so that is not unnecessarily sent to a dumpsite. We take care to select only quality recycled materials so that the bags contain rags that are thick and highly absorbent, making washing and drying cars faster and easier than ever before. In addition to being soft and absorbent, because the cotton textile material is also low linting and works well with cleaning chemicals, white rags can be used to polish the metal and glass car surfaces, as well as buffing the interior leathers, wood and plastic panels. So, whilst rags are typically an economical option, ensure that you still select quality suppliers for your white rags, as not all rags are the same! With TIDDOX WHITE T-SHIRT RAGS you are assured value for money and a quality product every time, that is metal detected and friendly to environmentally. Available in 10kg bags and conveniently portable 1.5kg bags.